Sunday is my day off, so I got the chance to make dinner. I bought some blood orange vinegar from Fox and Obel and have been dying to try it. I really encourage you to try different flavors of vinegars and olive oils, little nuances of flavor can really take your favorite dish to the next level. 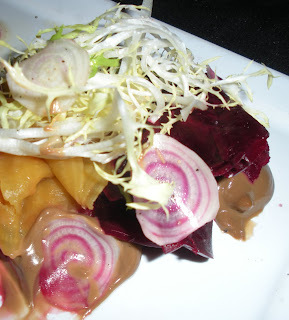 A gastrique is defined as a sauce that starts with a caramel, deglazed with acid. This sauce goes wonderfully with duck but I made it with pork last night and loved the results. Caramel, is easy to make, it’s a simple combination of sugar and water. Now I am not talking about gooey candy caramel, this is liquid mixture. Let’s get started. In a medium sauce pan, place sugar and enough water to make sugar like wet sand. Heat sugar on medium heat until sugar mixture is the color of honey. Remove pan from heat and add white wine and blood orange vinegar, stir continuously. Place back on heat and reduce mixture by ½, while stirring. Add chicken stock and reduce until nappe. Nappe is when you can take a spoon and coat it with the sauce, run your finger thru it and if the sauce holds it’s shape, you are there. Add Earth Balance Soy Free Butter Spread and swirl into sauce until incorporated. The term for adding the “butter” or Earth balance is Mount au beurre in French cooking. * Another way to get the same flavor is use 1 teaspoon of zest from your favorite citrus fruit and replace the blood orange vinegar with a cider vinegar. 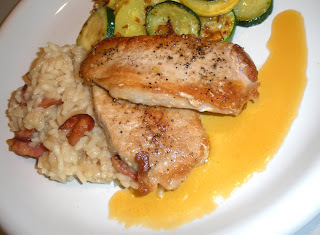 I served the gastrique with sautéed pork chops seasoned with salt and pepper, risotto and sautéed zucchini and squash with onions and garlic. The only bad part about this recipe is I don’t have any leftovers… Enjoy! Before class gets started, I want to send congratulations to Chef Giuseppe Tentori of BOKA for being nominated for a James Beard Award . Let’s hear it from those of you that went to the BOKA Safe & Sound dinner, Chef Tentori really deserves this special honor, his dishes have a delicate balance of flavors that have you feeling you never missed a thing…. 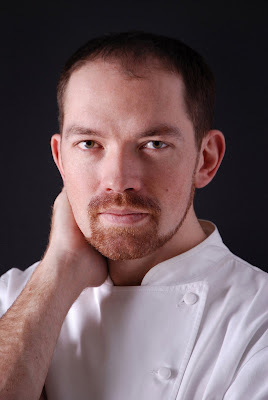 If you decide to visit BOKA, call a few days in advance so Chef Tentori can make you a meal you will not soon forget! It’s Restaurant Week in Chicago, so restaurants all over the city are preparing culinary delights for diners with special deals, these meals are sometimes served with decadent and flavorful sauces. After these meals, I always wondered how on earth can you recreate these at home allergen free? Well, you are in luck, since I attended the Le Cordon Bleu College of Culinary Arts in Chicago, you get to go back to the kitchen with me to start learning French cuisines and sauces sans allergens. We are going to start with the basics and learn to make stocks. Stock is a key ingredient for adding flavor to many dishes from soups to sauces. Of course you can buy stock in a pinch, but a homemade stock is full of wonderful flavor and is really quite easy to prepare. You might remember I made Julia Child’s Boeuf Bourgignon, this classic French dish explodes in flavor when you use homemade stock. So with that in mind we are going to make a brown stock that you can use for Julia’s classic dish, your friends and family will love it. Let’s start with some general knowledge on stocks. The bones of animals contain connective tissues called collagen, that break down while cooking to form gelatin. You can also find gelatin in cartilage found in knuckle bones or in joints. 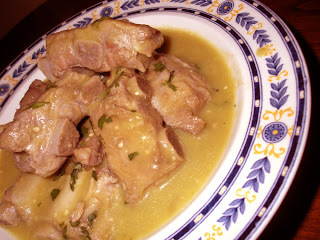 Gelatin adds thickness and body to the stock, in fact the more thick your stock is when it cools the better. Place bones in a roasting pan and cook for 30 minutes. Turn bones and roast until brown. Scrape fond out of bottom of pan and deglaze with 1 cup water, set aside. Brown vegetables in a separate pan and set aside. Gather sachet ingredients, place in a coffee filter, fold over so filter won’t open and add to pot. 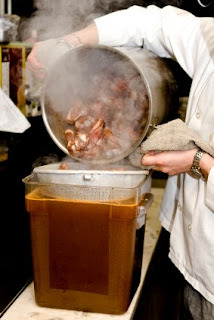 Simmer mixture for 6-8 hours and check periodically to skim the imperfections off the stock. In French cooking this is called depouillage. Remove stock from heat and strain out bones and mirepoix. You may notice that no salt is added to the stock. The reason for this is, a stock is a foundation ingredient; the seasoning comes in while preparing the final dish. This principal will continue as we learn to make sauces together. Rinse chicken bones to remove impurities. Add bones to cold water and start to bring water to boil. Bring water to boil, depouillage. 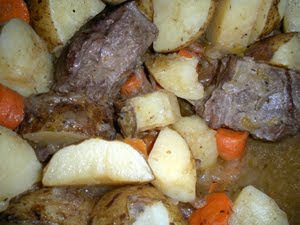 Reduce mixture to a simmer and cook for 3-4 hours. I got an email at work yesterday that a gluten free dairy free vanilla cake was in the oven and would be waiting for me when I got home. All I can say, is I am in love… both with my husband Mark, that baked the cake and the cake itself. 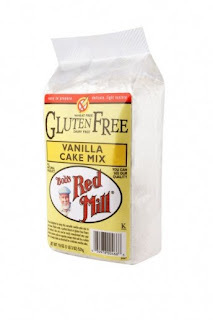 Bob’s Red Mill has done it again, this moist cake has the consistency and flavor of a light pound cake and none of the baking soda-ey taste some of the GF products have. On the product page for this site there are recipes for modifying this mix or adding toppings, quite honestly we enjoyed this cake without any topping at all, I can imagine frosting taking it over the top! This mix requires eggs, for an egg free version, go to Bob's Red Mill. 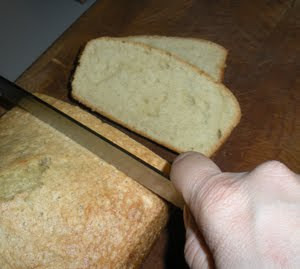 Mark used a silicone loaf pan to bake the cake; this worked out great since this cake isn’t crumbly and it made taking slices on the go a snap. 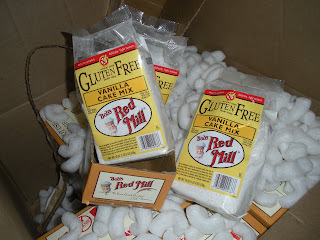 I am happy to announce that Bob’s Red Mill Vanilla Cake Mix will be in the gift bags at the next Safe & Sound dinner! 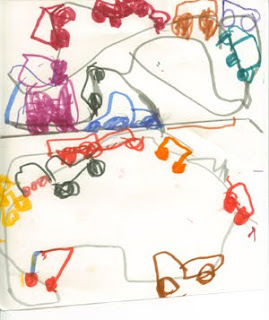 The next pick is something I have been thinking about for a few months. I love the variety of flavors you can find in rice, potato and corn pastas, but I always thought the shapes were a little limited. 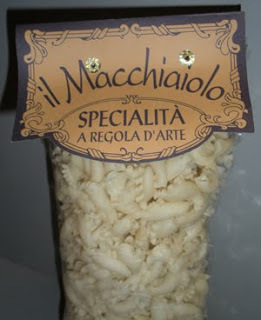 Well, no more, I was strolling thru Fox and Obel (I had a gift card that was burning a whole in my pocket) and I found the most lovely rice pasta from il Macchiaiolo . 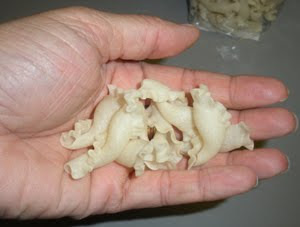 This Italian pasta was not only delicious, but intricate and whimsical in shape. If you want to add a little moxy to your next Italian feast this pasta will do the trick! I had so much fun yesterday giving out gift bags to people who couldn’t attend the Safe & Sound Dinner, I even got some lovely handmade Valentine’s, a total surprise I will cherish! 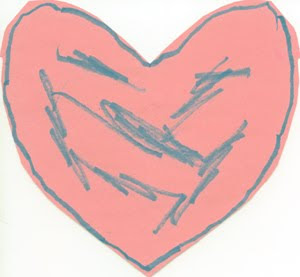 These heartfelt gestures got me thinking why I do this blog and host the dinners. It feels so good to get emails from the parents of little allergenistas, stating how excited they were to have treats that were safe for them to eat. It’s just like at a dinner when people who normally shy away from dining out, are so thankful to have found a new restaurant they can go to with friends without allergies and know they won’t get sick. I want to thank everyone who has supported my blog and website, because by helping you live a better life with food allergies, you added happiness to my life that is immeasurable. How nice it was to have a pot roast waiting for me on Friday after braving the cold and the hefty commute from Schaumburg back to the city. I hope you enjoy this meal as much as we did… Thanks Chef Mark (my husband)! Add 2 tablespoons extra-virgin olive oil to large skillet on medium-high heat. Sprinkle salt and pepper on both sides of chuck roast. Add to pan and brown on all sides, set aside. Add 2 more tablespoons of olive to pan and add onions, garlic and celery. Cook until soft - about 10 minutes. Add better than buillion, rosemary, ground thyme, kosher salt and ground black pepper. Add enough water to just cover beef. Add carrots and potatoes simmer another hour until meat is tender. 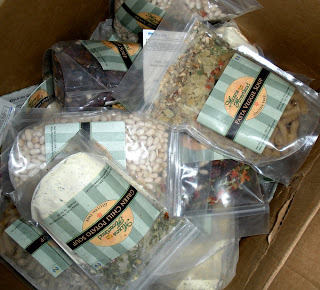 Ok, I have been going on about all the wonderful product I received for the Safe & Sound Dinner, and it didn’t seem fair for those of you who couldn’t make it, so I had an idea for all my loved ones with food allergies…If you are in the Chicagoland area on Sunday and want to pick up a giftbag of your own filled with allergen free swag… I will be home on Sunday and will be giving bags away if you come and get them at my home. It is first come first serve, so email me at info@lisacooksallergenfree.com and I will send you my address. There are a total of about 25 bags and I will save 5 for out of towners that email me their address (sorry you won’t get it in time for the big day). 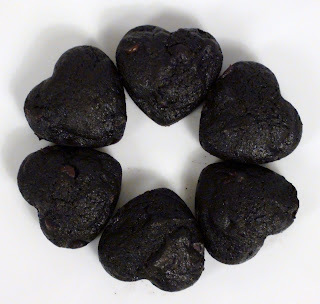 Now I don’t want to leave anyone out of the Valentine’s Day treats, so below I am posting some treats you can buy for your sweethearts…and also some recipes you can make for a night in. Enjoy! Kind Bars – I found this gluten and dairy free treat by reading a post from Gluten Free Betsy, Starbucks was giving away samples last Friday, I got the Mango Macadamia and have been hooked ever since. It has a nice tangy taste and is high in folic acid and Vitamin D3 and is a good source of fiber. A perfect good morning for your active allergenistas. 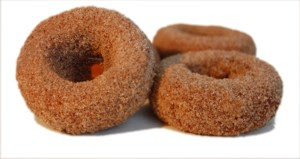 This is more for the decadent Valentine’s Day Breakfast… I went to the Free From Market in Orland Park where I got the chance to pick up some tasty Kinnikinnick Cinnamon Sugar Cake Doughnuts, I swear to you, no one will ever know the difference between these and their Gluten Full counterparts. A big kudos to Kinnikinnick, the strides you have made, wow! Ok, on to recipes that will say nothing but love, enjoy! Spring Rolls – Chinese New Year is on Valentine’s Day! Sugar cookies – use your heart cutter! Oh, the weather outside was frightful, but the Safe & Sound Dinner at Landmark was delightful! Last night, Chef Kurt and the team at Landmark Grill & Lounge wowed our group of allergenistas with the hearty, flavorful food that this Chicago hotspot is well known for. 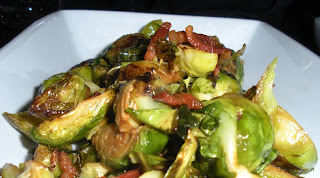 Some of the many items on the menu included roasted beet salad with a balsamic emulsion and frisee salad, topped with jalapeno oil, grilled flank steak with roasted cipollini onion and balsamic reduction and smoked brussel sprouts served with bacon. 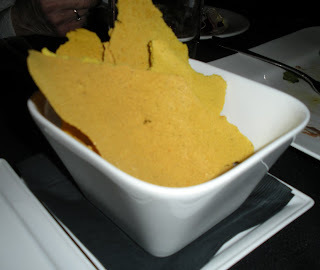 Chef even made homemade crackers to go along with our lamb rillette. 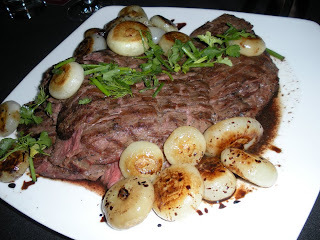 What I really enjoy about Chef Kurt’s food is that I always leave enjoying a new food, the cipollini onions are something I haven’t used much, but sure plan to now; the sweetness of this onion complimented the flank steak perfectly. I also was one of those kids that refused to eat brussel sprouts. Please don’t tell my mom, but she was right, they are heavenly…ala Landmark! I went over the menu one more time before the dinner with Chef Kurt and he was explaining how he enjoyed preparing this meal and looked forward to meeting the needs of the allergen public. For the best meal, Chef recommends calling a few days in advance, so he can have all the ingredients on hand to accommodate your dietary needs. After we thought we couldn’t eat another bite, out come the SWIRLZ CUPCAKES, and chocolate nirvana was achieved! 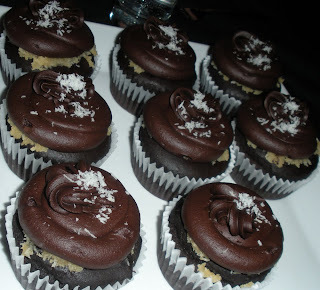 Pam Rose brought Jerry Korab to the dinner, the creator and baker of the decadent vegan gluten free double chocolate cupcake, topped with a layer of german chocolate, coconut topping and chocolate vegan frosting. He loved meeting with everyone and really got to see how much his gluten free creations mean to us allergenistas, thanks so much SWIRLZ, you really do make us happy with your wonderful cupcakes! What can I say about the gift bag, except that it was filled to the max with wonderful allergen free swag, a great way to work off the calories, lugging it to your car! Please don’t feel left out if you can’t make it to the dinners, I have some extra treats I want to share and am working out the details how… stay tuned! Who will win in Miami, while I don’t have the answer for that, I can tell you that you and your guests will win with a killer allergen free menu. Beef Brisket sandwiches – just pick your favorite allergen free bread and you are on your way, these are great because they cook in a crock pot all day. 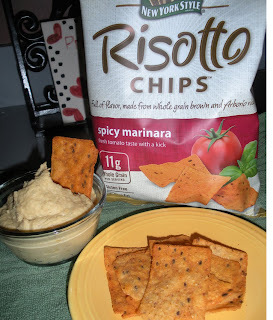 I also have included a quick and simple recipe for hummus, and a wonderful new product I found to go with this tasty dip at the Cermak Market on North Avenue called Risotto chips. These all natural chips, made by New York Style Brands, are produced on a dedicated gluten free line and contain 11 grams of whole grains. You can find Risotto Chips in Spicy Marinara, Parmesan & Roasted Garlic and Sea Salt. I emailed the manufacturer right after I got this product to find out if they used a dedicated line, they do and they even sent me full size bags to give out at the Safe & Sound dinner. Boy, I hope the bag is going to fit all this stuff! 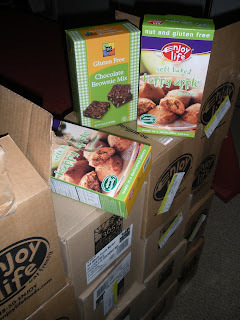 Whole Foods Market – Halsted just gave us GF Brownie Mix and Enjoy Life Soft Baked Happy Apple Cookies I have so much extra product, I am thinking a recipe contest is in order to give away these great samples, what do you think allergenistas? 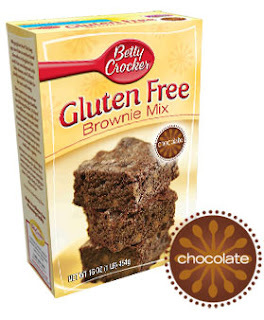 I also received coupons from Betty Crocker for a free package of one of their GF baking mixes… I haven’t tried these mixes yet, but can’t wait, any allergenistas want to share their experience? If you wanted to get a little creative; sorry, I ran out of time to assemble this recipe, but you can do it, remember cooking is easy! Assemble a nice 3 layer dip with some guacamole, a puree of some canned black beans and a clove of garlic, tomatoes cut small or chunky salsa and voila, a perfect dip safe for everyone. It Feels Like Christmas in February! 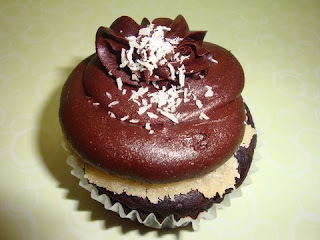 The biggest news - I got an email from Pam Rose at SWIRLZ CUPCAKES (swirlz and she has developed the most decadent cupcake special for our dinner, free of all the allergens except soy (don’t worry my soy allergenistas, there will be a wonderful substitute for you). Ok, get ready to drool, the cupcake is a vegan, gluten free double chocolate cake, a layer of vegan/gluten free german chocolate and coconut topping, topped with chocolate vegan frosting, I guess I am going to need my eating pants for this dinner! The best part is Pam always gives a coupon for a free cupcake in the gift bag, so you can go and sample her different flavors, go early, Pam only makes GF/Vegan cupcakes first thing to avoid any cross contamination, so once they are gone, they are gone for the day! Just a few tickets are left, don’t miss out on this wonderful evening. Next up: Recipes for Super Bowl Sunday, time to snack! With the Safe & Sound Dinner just a week away, I am starting to get in the most delectable gift bag treats… Space is limited and requires advance reservations. I really like spicy food during the winter months, so this recipe comes from Mexico with some heat. 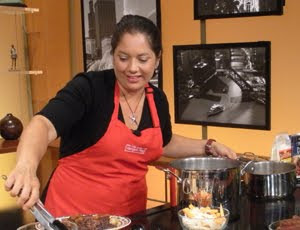 I adapted this recipe from fellow chef, Elizabeth Hernandez, we attended Cordon Bleu Chicago together. Each of us were required to bring in a dish to our menu planning class that we would include on our dream restaurant menu. 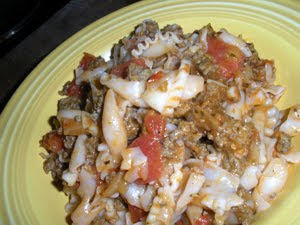 I just loved this dish and Elizabeth was kind enough to share the recipe. The Tomatillo sauce has some kick, if you want to bring it down a notch, remove the seeds and membrane from the jalapenos. Heat sauce pan over medium high heat, add oil and heat another minute. Add pork rib tips and brown evenly on all sides. Add Kosher salt and enough cold water to just cover the rib tips and simmer for about 45 minutes until meat is soft, set aside and reserve cooking liquid. Bring a pot of water to a boil and add tomatillos and jalapenos, cook for 30 minutes or until soft. Add tomatillos, jalapenos and ½ cup of meat braising liquid in a blender and blend thoroughly. Add sauce to pan and place meat in pan to reheat. 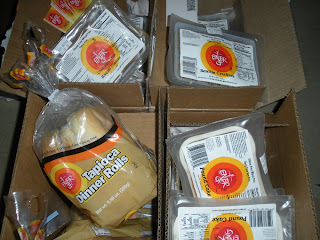 Season with additional kosher salt to taste.Serve with your favorite tortilla and Mexican toppings.